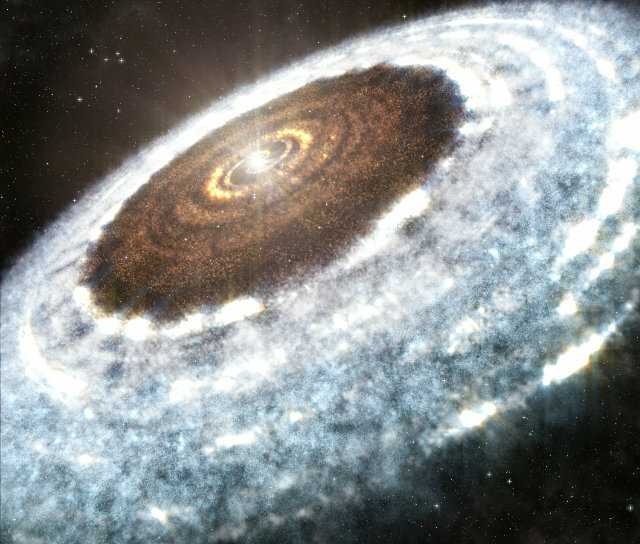 An article published in the journal “Nature” describes the first observation ever of the water snow line in the V883 Orionis system. Using the ALMA radio telescope, a team led by Lucas Cieza of the Universidad Diego Portales, Santiago, Chile, identified the distance from the star beyond which the temperature drops enough for water to freeze. V883 Orionis is a young star about 1,350 light years from Earth surrounded by a protoplanetary disc composed of dust and gas. 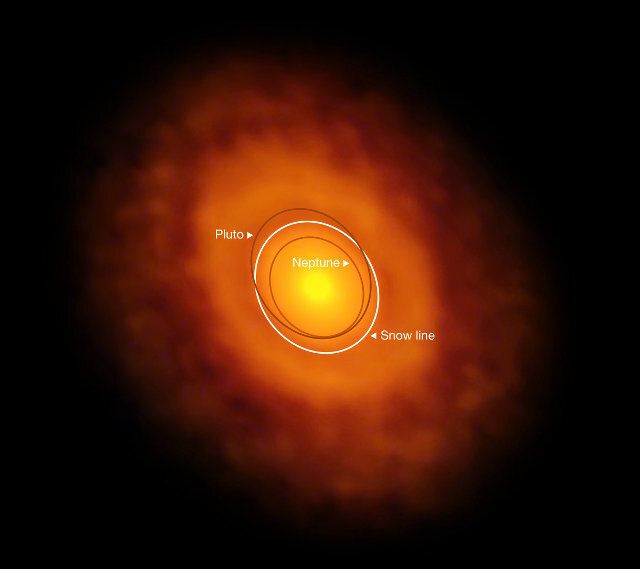 The term protoplanetary is used because that’s the type of disc from which planets are born thanks to the slow accumulation of dust grains into larger and larger objects. In the case of a star such as the Sun the water in the protoplanetary disc remains in a gaseous state up to a distance around three times that between Earth and the Sun. Once past that distance, at the very low pressure in that area water freezes directly forming a layer of ice on the dust grains. The ALMA (Atacama Large Millimeter/submillimeter Array) radio telescope, inaugurated in March 2013, was already used in the past to identify the snow lines of other molecules such as carbon monoxide and methane. The problem with that of water is that the distance from its star is generally too limited to be able to directly observe it even with extremely sophisticated instruments such as ALMA. However, this time the researchers were able to identify the snow line of water thanks to a lucky event connected to the nature of the star V883 Orionis. In fact, it’s a star of the FU Orionis class, which isn’t yet in the main sequence and at irregular intervals shows considerable changes in magnitude and spectral type. In the case of the star V883 Orionis, there was a considerable increase in brightness resulting in an increased heat output as well. The consequence is that the snow line of water moved a lot. V883 Orionis has a mass that is about 30% greater than the Sun so originally the snow line of water was at a distance of about 3 times that of the Earth from the Sun. After its heat increase it moved up to a position roughly equivalent to the distance between Pluto and the Sun, about 40 times that of Earth from the Sun. This discovery is important because the presence of water ice could be a factor in the birth of planets. According to current theories, where the water is in the form of vapor rocky planets form, instead where it’s frozen it can form large accumulations which attract other elements and lead to the birth of giant planets. Strong changes such as that observed in the star V883 Orionis with the consequences on the snow line may be common in solar systems’ first stage of life. Observing these events is important to understand the influence of these changes because even the Earth could be the result of that phenomenon.